I've had several requests and inquiries from those with Greek background regarding their numerology charts. Below are two tables you can use to convert your name from a Greek to a Roman letter equivalent ... which you can then use to calculate your Expression, Heart's Desire and Personality numbers using the calculator to the right. You can also use your converted name and submit it for the free reading service I provide. 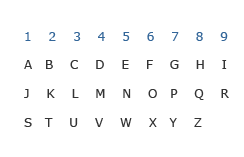 It should be noted that whenever you are working with a non Roman alphabet, such as Greek, Hebrew, or Japanese, to name just a few examples, it is best to use the numerology system that is native to your mother tongue and one which was derived with your language and culture in mind. 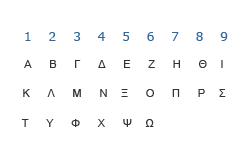 Nevertheless, the following key charts can be used to assign the actual numerical influences of each letter of the Greek alphabet, and then used for conversion to the identical letter values of the Roman alphabet. I programmed the script to automatically determine whether the Y in your name (if you have one) should be a vowel or a consonant. However, if you'd like to force the Y to be used as a consonant, use the asterisk * symbol in its place; or the # symbol to use it as a vowel. Hi, I have a Greek name and I live in London. Is it not accurate if I put my Greek name with the English alphabet, as I write it for English people for example?